A poster illustrating this annual series is on sale at the price of 1000 F CFP. Catalog of the first philatelic exposition - 50 years of emotions. 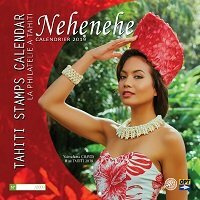 Numbered in a limited edition of 2000 copies of which only 900 are on sale in the OPT agencies on the territory, large format 40 cm x 60 cm with a fifth golden color 2014 calendar showcases famous Polynesian 6 stamps on the theme of the Vahine. 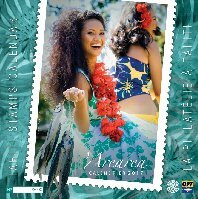 True collector's item, this calendar is the first in a series which OPT has already adopted the theme for the next 10 years.